According to the Bible, the spiritual forces arrayed against Christians are staggering. The pressures to sin that we face can sometimes seem overwhelming. These principalities and powers, these Satanic influences, these fallen angels and demons are ready to crush us, to overpower us, to try to get us to cave in to the pressure. F.B. Meyer once said that when we see a brother or sister in sin, we should not look down on them, because there are two things we do not know: First, we do not know how hard he or she tried not to sin. And second, we do not know the power of the forces and the spiritual pressure that assailed him or her. A recent survey of Discipleship Journal readers ranked areas of greatest spiritual challenge to them. On the top of the list was Materialism. Second on the list is pride. Some of the others, in order, were Self-centeredness, Laziness, Anger/Bitterness, Sexual lust, Envy, Gluttony and Lying. 81% of survey respondents noted that temptations were more potent when they had neglected their time with God (81 percent) and when they were physically tired (57 percent). Resisting temptation was accomplished by prayer (84 percent), avoiding compromising situations (76 percent), Bible study (66 percent), and being accountable to someone (52 percent). This survey fits right in with what we have come to today in the book of Luke. Last week, from Luke 4 we began to look at the three temptations of Christ in the wilderness. We looked at the first temptation, which was the temptation to turn bread into stone: The Lust of the flesh. In this message, we turn to look at the second and third temptations: The Lust of the Eyes and the Pride of Life. Notice that they are the two temptations which are at the top of the list from that survey I just read. Respondents said that the things they struggle with the most are Materialism, that’s related to the lust of the eyes, and Pride, which is, of course, the Pride of Life. So if these are a pressure in your life, as I know they are, we will be looking at both of these today. I also thought it was interesting that the respondents to the survey said that they were tempted the most when they didn’t get adequate time in the Word of God. There are always other factors, but having enough time feeding on the Word is most of the battle. And that is how Jesus countered the first temptation. He knew the Word and He used the Word. Rather than turn stones into bread, Jesus was able to stand up against the Satanic pressure to sin because He was filled with the Word and fed on the Word. And that is exactly what we will see Him do with the second and third temptations today in Luke 4:5-13. Let’s begin right away with looking at the second temptation. The Lust of the Eyes in Luke 4:5-8. Luke 4:5. Then the devil, taking Him up on a high mountain, showed Him all the kingdoms of the world in a moment of time. Luke 4:5 shows us that this is the lust of the eyes. Satan showed Him all the kingdoms of the world in a moment of time. Jesus, you must know, came to be the king of the world, that is what was promised to Him by God. And so in Luke 4:6-7, Satan offers the world to Jesus, with one small condition. Satan is giving a half lie here. While it is true that He is the god of this age and the god of this world, it is not true that he owns them and can give them to whomever He wishes. When Adam listened to and fell before Satan, Adam, in essence, gave up his power, his dominion, to Satan. He forfeited the earth to Satan. Satan took control of the earth, but it is not Satan’s to give away (Daniel 4:32). However, if Jesus were to bow to Satan, the title deed to the earth truly would have passed to Satan. So, there is a little half truth here from Satan, and some wishful thinking. Nevertheless, Satan offers to Jesus what he does have: rulership over the earth. He is offering to Jesus an easy road to become the political, military, ruling sort of Messiah that most of the Jews in that day were expecting. But there was one little hitch. Only one little condition. He says, if You will worship before me, all will be Yours. The word for worship is proskynēsēs and literally means “to bend the knee.” Satan is asking Jesus to bend the knee. You see, Satan knows that a day is coming for him which he is not at all looking forward to. It is a day when he will bend the knee before Jesus. Satan is trying to turn the tables on Jesus. Satan is trying to get what belongs to Christ alone. If Jesus bows to Satan, the whole universe would too. But due to Christ’s victory, Philippians 2:9-10 says that God has exalted Jesus, and given him a name above every name, that at the name of Jesus, every knee should bow, those in heaven, and on earth, and under the earth. Satan knew that this is one of the reasons Jesus came to this earth — to get the dominion back. To regain control of the earth. And Satan doesn’t want to give up control. He doesn’t want to bend the knee to Jesus. Satan is offering to Jesus a shortcut in God’s plan. A fast track to accomplishing God’s will. The easy shortcut around the cross. Satan loves to offers shortcuts. He always says, “Hey, here’s what God has promised to give to you, but God’s ways take too long and require too much effort. I can give these things to you right now if you will just worship me.” Satan is the king of instant gratification. He was the one who first came up with the slogan, “Your way, right away.” And the trick to his temptations of this sort is that he always offers us God’s promises, but with a shortcut. Remember Abraham? What was his temptation? “Abraham, God said that you would have a son. But you haven’t had one yet, so just go and sleep with your wife’s maidservant Hagar. That will give you a son.” And Abraham did it, and we are still feeling the consequences of that choice. Then there was David. “David, God promised that you would be king. And here is Saul, asleep in this cave. Go ahead and kill him, then you can be king. He does deserve to die, you know.” But David did not do this, and he is called a man after God’s own heart. As you read through the Bible, watch for these sorts of situations. God promises something to someone, and only a few verses or only a chapter or two later, that person will discover an opportunity for a shortcut. Oh sure, he may have to break a command of God or two. Oh sure, he may have to murder a few people. Oh sure, he may have to lie a bit. And sometimes they choose the shortcut and sometimes they don’t. But those who choose the shortcut always end up with problems. You see, whenever God promises us something, the route to get there is often full of potholes and detours. And knowing this, Satan often comes along and offers us a shortcut. The only minor drawback, the one little hitch, the fine print is that it involves turning our back on God for a little bit. And when we choose to sin in order to accomplish God’s purposes, sin taints the achievement of those purposes also. We often think the end justifies the means. But we should never be pragmatic in the Christian life. You see, a lot of Christian operate under the idea that “If it works, it must be okay.” Some churches cater to unsaved people in order to attract them into the church. I heard of one church that put on a mock strip tease. Another where the pastor behaves like a pro-wrestler. His preaching platform is even patterned after a professional wrestling ring. He gets up there and “wrestles with the devil” while he preaches. Those are extreme examples, but there are other examples not so extreme. Church growth, God says, is accomplished by making disciples. And how do you do that? You preach the Word, you pray, and you fellowship with one another. That’s it. Only in this way will true growth, true discipleship be accomplished. When we accomplish God’s purposes in God’s way in God’s timing, there is no sweeter experience. Look at Jesus’ response in Luke 4:8. Jesus saw right through the temptation and knew that in order to gain God’s promises, we need to do it in God’s own ways. He quotes here from Deuteronomy 6:13. There, Moses is instructing the people that when they get into the Promised Land, when they gain the authority and glory that has been promised to them, they must not forget God and bow the knee to false Gods. Instead, they must continue to worship God, and serve Him only. Now, although Moses warned the Israelites about this, we know that they did not obey. They did turn after other gods. They did forsake the only true God. They did bend the knee to pagan deities. Jesus is not about to make that mistake. He will not fail as Israel failed. He knew His Bible, and knew that there is no shortcut to achieving God’s promises. God’s will for your life is only accomplished in God’s ways according to God’s Word. This is what Jesus did, and he walked the long road to the cross, and as a result, we know from the book of Revelation, that he will return to claim the earth and rule over it as God has promised. Jesus knew that the end did not justify the means. In order to truly accomplish God’s will, He had to travel in God’s ways. God does not do short cuts. Is there a temptation in your life to take a shortcut to spirituality? A temptation to take a short cut to accomplish God’s will? There are many churches and organizations today that are offering short cuts to spirituality. From some organizations, for a tax-deductible gift of only $30 you can own an “anointed cloth” which will fend off the devil and give you spiritual peace. Another group sells music tapes with subliminal messages that will help you defeat any sin in your life. Just send in $20, and when the tape comes, pop it in your tape player, and voila, you will be free from sin. But there are others, not so extreme, who say that the short cut to spirituality is speaking in tongues, or having some experience, or that you are truly spiritual if you get slain in the spirit, or experience holy laughter or see a vision of heaven or whatever. There are no shortcuts to spirituality. Spirituality comes through becoming like Christ as submit to the Lordship of Christ in our life, and do His will in His ways as found in His Word. Do you want to be spiritual? Satan is offering shortcuts, but don’t take them. His promises are never what they seem. Jesus was offered a shortcut, and He knew the Word of God well enough to fend off this second attach of the devil. But Satan has one more swing. He’s struck twice, and in Luke 4:9, he steps up to the plate for the third time with the Pride of Life. This highest point of the temple was probably the southeast corner of the temple which loomed over a cliff of the temple mount. If this is where Jesus stood, he would be about 450 feet over the ground. 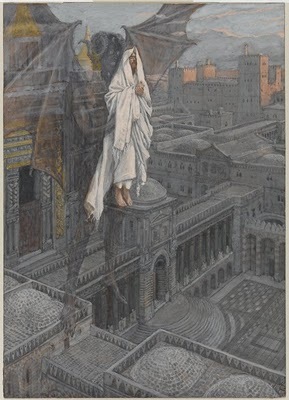 From there, he would be able to oversee all of Jerusalem, and all the people down below. In the previous two temptations, Jesus has thrown Scripture back in Satan’s face. So now, Satan says, “Oh yeah? Two can play that game.” And he begins to use Scripture in his temptation. Look what he says in verse 10. The angels are not there to keep Jesus, or to keep you from committing suicide. No, the angels are there to help you walk in obedience to God. Yet Satan, by leaving out four little words, twisted this Scripture to try to get Jesus to do exactly the opposite of what the verse actually says. Satan twists Scripture to tempt Jesus to perform an amazing demonstration of his power. He was on the roof of the temple. There were crowds of people down below — maybe some of them saw him up there and were beginning to point — and maybe wondering how in the world he got up there. Do you see Satan playing to the pride? But Jesus does what we should do, and throws Scripture right back. Look at Luke 4:12. In the two previous temptations, Jesus has quoted from Deuteronomy, and he does so again here. This time, he quotes from Deuteronomy 6:16. There, Moses is reminding the people of the time when they doubted whether God was really with them or not (Exodus 17:7). They had seen God miraculously provide for them time after time. But then the days in the wilderness got long and hot. And they ran out of water. And so they began to doubt that God was still with them. They began to wonder if he had forgotten about them, or abandoned them. And they complained. They accused Moses, and therefore God, of bringing them into the desert just to die. But what they were really doing, according to Exodus 17:7, was testing God. In their complaining, they were saying, “If God is really there, and if He really loves us, He will provide water for us.” Well, God did provide water for them — out of a rock — but he was not happy about their lack of trust. But Jesus chose wisely, where the Israelites did not. Where the Israelites tested God, Jesus would not. He knows that we are not to deliberately put ourselves in jeopardy just to see if God will save us. That would be tempting God. You know, some Christians do this today. At the end of Mark, it says that Christians will drink poison and be bit by snakes and yet not die. So there are some Christians who make it a practice to handle poisonous vipers because they want to see if God will protect them. This is tempting God. Now, missionaries sometimes, because they are dying of thirst, have to drink water that they know is filled with malaria, but they do not get malaria. Sometimes, while walking through the jungle, they get bit by poisonous snakes, but they don’t die. You see, they were not tempting God, they were going about his service, and he protected them. There is a balance in all of this. Many Christians struggle with spiritual pride. They believe they can venture into dangers and circumstances where nothing but a miracle can save them. Some people rack up debt praying that God will help them win the lottery. Some get sick and don’t use the healing power which God has provided through doctors and physicians, but instead just trust that God will simply heal them. Now God can do that, but I don’t think it’s the way God works. To expect God to heal you when you don’t make use of the means He has provided is testing God. But that is similar to what Satan was telling Jesus to do here. Just trust in God that he will protect you when you put yourself in harm’s way. We must be very careful and not tempt the Lord our God. If we make foolish decisions based on some improper understanding of the Sovereignty of God, He is very likely to step back and let us experience the consequences of our foolish decisions rather than step in and help us out of the predicament we got ourselves into. Jesus knew to not put himself in that situation in the first place. And so he resisted this third temptation. And look at the result in Luke 4:13. Luke 4:13. Now when the devil had ended every temptation, he departed from Him until an opportune time. Jesus wins this battle, and so Satan flees and waits for another opportunity. There were several opportunities like this during Jesus’ three and half years of ministry. One is when Satan, through Peter, tells Jesus that He will not have to take the road to the cross. There, just like here in Luke 4:8, Jesus says, “Get behind me, Satan.” One opportune time comes in Luke 22:3 when Satan enters Judas Iscariot. Another attempt might have been on the night before his crucifixion in the Garden of Gethsemane. But He handled every temptation by wielding the Sword of the Spirit which is the Word of God. Is there a sin that gets the best of you over and over and over? You know what? Study the Word of God and memorize Scripture so like you can quick draw against Satan’s lightening attacks. Whenever that temptation comes your way, pull out the Word of God, read it, study it, quote it. There’s no twelve steps, no support groups, no flowcharts, no delving into forgotten childhood memories. I suppose from Christ’s three temptations, we could come up with three steps. From the first incident we see the first step to overcoming temptation — arm yourself with the Word of God. From the second temptation, we see the second step, which is — arm yourself with the Word of God. The final step in overcoming temptation, or course, is to arm yourself with the Word of God. It sounds simplistic, but if it was good enough for Jesus, it’s good enough for me. Remember that the Word of God is living and active, and sharper than any double-edged sword (Heb. 4:12), and that the Holy Spirit works through the Word. What is your temptation? Are you even aware that you are being tempted? Are you aware that the devil is prowling about like a roaring lion seeking whom he may devour? Do you know how he is currently trying to devour you? Often Satan comes to tempt us with very simple and seemingly innocent things. He offered Jesus a piece of bread, a chance to be a leader, and a sign from God. All good things in and of themselves. None of them were bad. None of them were evil. They were things God had promised to Jesus and to us. The temptation was in the shortcut. But the hidden lie is that Satan’s shortcuts always end in disaster. If you’ve ever read John Bunyan’s Pilgrim’s Progress, you know that Christian is always being tempted by someone to stray from the path, to take an easier route. Sometimes he does, and disaster is always the result. God’s will must be accomplished in God’s ways. Like Christian, all of us face pressure to sin every day. Temptation is constant and all around us. It comes from Satan, the flesh and the world. It is trying to get us to cave in. Underwater vessels like atomic submarines have a depth limit in which they must not exceed in order to keep from getting crushed. Once a submarine called Thresher exceeded this depth. As the underwater pressure increased, the seawater crushed the sub’s heavy steel bulkheads as if they were made of cheap plastic. Of course, everyone on board died. Yet, amazingly, there are fish in the sea who can live at the same depth, and even deeper, without getting crushed. How can these fish survive when the pressure is so great? The answer is that these fish have equal pressure within themselves. If you were to bring one of these fish up to our level, they would explode. But down where the pressure is great, they survive easily because of the equal pressure inside. So should it be for all Christians. In ourselves, we are doomed. Satan is exerting pressure on us to cave in and collapse. He wants to crush us under his thumb. But, in Christ, with the Word of God filling us, there is no temptation God will allow you to face which you cannot stand up under. The inner pressure of Christ and the Word gives us the strength to resist the outer pressure of temptation. Are you facing severe temptation from without? Increase the pressure within. The more tempted you are, the more time you should spend in the Word. Not only will this help you resist both the temptation, but it will also cause the Tempter to flee. You see, the last thing Satan wants you to do is spend time in the Word. And if he sees that every time he tempts you, you automatically turn to the Word, he will flee until a more opportune time. This is what Jesus has shown us today. If you are filled with the Word, you will not fall to the Devil. Nelson’s New Illustrated, p. 1257. Three ideas taken from Jon Courson, Appl. Commentary, 309. T.A. McMahon, “The Berean Call Newsletter,” March 2004. “The Gratification Temptation” Homiletics, March 2001, 16-19. When you say temptation comes from Satan, are you saying that temptations are caused by him from the exterior (outside) of our minds? Or does Satan really work internally? This is a topic I’ve been quite confused about for some time. Adnama, to my understanding satan could work in both ways. Externally also internally. When I say internally, unless he/she allow him to work in someways he can’t work internally. In matt 16:17,heavenly father reveal about jesus to peter. Which means he internally didn’t allow satan into his heart. But, Luke 22:3 Satan enters Judas Iscariot, here there were a vacuum in his heart. That allowed satan to enter in his heart. I was taught by my teacher that the devil always temped us with three thing: the Lust of the eyes, the pride and half lie. This happened since the first time in garden of eden….and I suppose, until now, the devil still using this strategies…. all the time….!!! !